Iran and the United States have at least one urgent interest in common: Their wrestling federations have teamed up to salvage wrestling for the 2020 Olympics after the Olympic Committee recommended dropping the sport in February 2013. The Iranian and American teams were scheduled to hold two friendly matches ― in New York on May 15 and in Los Angeles on May 19 ― to raise the sport’s profile before the committee makes a final decision in September. The Iranians beat the Americans 6 to 1 in New York. But the Iranian team’s first trip to the United States in a decade was cut short. The team abruptly flew back to Tehran on May 16. Iran’s wrestling federation told its U.S. counterpart that the team’s schedule had changed but did not provide further explanation. The Iranians said that they remain committed to keeping wrestling in the Olympics. Despite tensions between their governments, the American and Iranian wrestling organizations have developed a unique relationship over the past two decades. Iran’s national team has competed in the United States ten times since 1995. U.S. participation in Iran’s 1998 Takhti Cup marked the first visit by an American sports team since the 1979 Islamic revolution. The team has competed in Iran ten other times since then. Rich Bender, executive director of USA Wrestling, discusses the U.S.-Iran wrestling relationship. What is the nature of the U.S.-Iran wrestling relationship? We have a positive and strong relationship built on years of competition. The U.S. team has been to Iran 11 times. I have been on four of those tours, and the atmosphere has always been really positive. We have been greeted with open arms. Iranians have shown our athletes a great deal of respect on and off the field of play. Iranians have a high degree of wrestling knowledge, and they appreciate high-level competition. They have been really supportive of our athletes and have cheered them on. Most U.S.-Iran interaction revolves around competitions and exchanges, with the exception of our current joint effort to keep wrestling in the 2020 Olympics. How are Iran and the United States coordinating their efforts to keep wrestling in the 2020 Olympics? I visited Iran for the freestyle World Cup in mid-February, less than a week after the Olympic committee recommended dropping wrestling. After I landed in Tehran, I immediately started talking to my Iranian counterparts about ways to collaborate. What difference do matches like these have on diplomacy with Iran? What is the role of sports between nations? Sports are a force for good. They bring people together. And interaction increases understanding and lowers barriers. Love of sports is a commonality even among nations that see things differently in terms of politics and religion. “Ping-pong diplomacy” had a positive impact on the U.S.-China relationship in the early 1970s. The exchange of players helped pave the way for President Richard Nixon’s 1972 visit to Beijing. Wrestling in particular is one of the best sports to provide the opportunity for collaboration. The upcoming exchanges in Los Angeles and New York will feature some intense matchups. But the events are solely about raising wrestling’s profile. The U.S. and Iranian teams want to make a strong case for keeping wrestling in the Olympics. How do the two teams compare? Iran, Russia and the United States have the top three teams in freestyle wrestling. Iran’s team won six medals at the 2012 Olympics, including three golds. Iran has won 38 medals in wrestling since 1948. In the 2012 games, the U.S. team took four medals, including two golds. The United States has won 129 medals in wrestling since 1904. Iran won the freestyle World Cup in February 2013. Russia took second place, followed by the United States. How do U.S. and Iranian wrestling styles differ? Neither team has a particular style. The great thing about wrestling is that no technique necessarily works better than another. The athletes use a diverse range of styles and skill sets. There are similarities on both sides of the mat. Some wrestlers tend to be very technical, while others focus on their power. How often do the teams compete? How do the athletes and coaches get along? We meet just about every year at the World Championships, sometimes at World Cups and some other competitions. The United States regularly attends Iran’s annual Takhti Cup. The teams have a mutual respect for each other’s skills. The head coaches of the two teams, Zeke Jones and Gholamreza Mohammadi, actually wrestled against each other in the early 1990s. So the rivalry between the two teams has some history. The current rivalry dates from the finals of the 2012 Olympics. 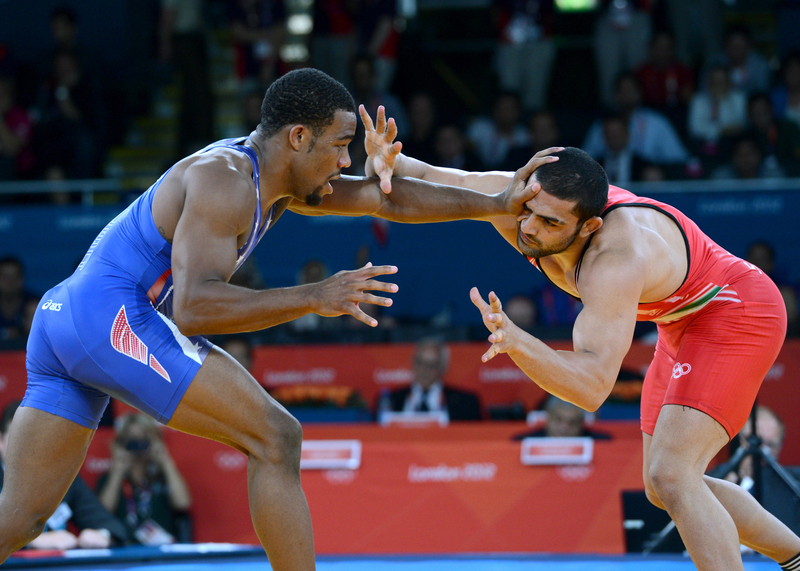 Jordan Burroughs beat Iran’s Sadegh Goudarzi for the gold medal in the 74 kilo weight class. One of the most interesting matchups in the upcoming tour will be between 120 kilogram heavyweights Tervel Dlagnev and Komeil Ghasemi. Iran’s Ghasemi beat Dlagnev for the bronze medal in the 2012 Olympics. Friendly meets and exchanges provide opportunities for interactions off the mat, including occasional team meals together. But for the most part, athletes from both teams tend to stay in competition mode and focus on the matches. Rich Bender is the executive director of USA Wrestling. 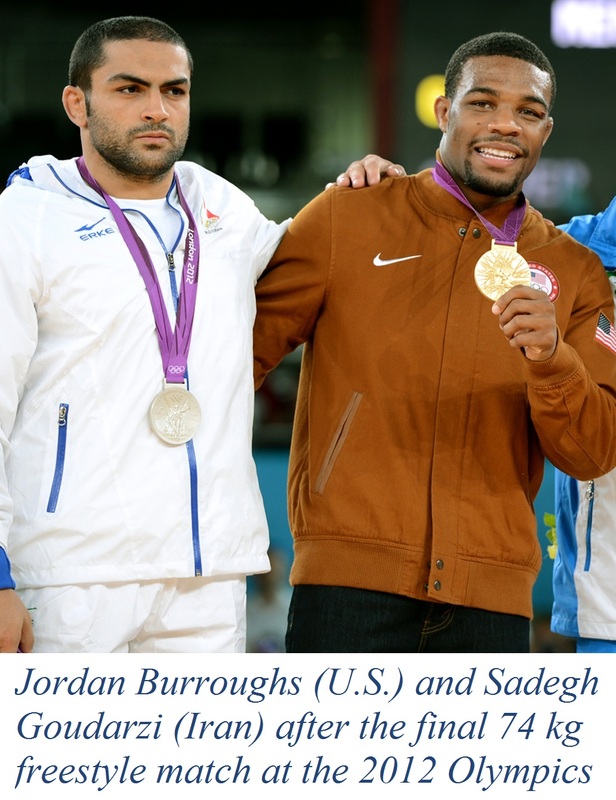 Photo Credits: Jordan Burroughs and Sadegh Goudarzi at the 2012 Olympics, courtesy of USA Wrestling. Click here for more information on the friendly matches.